I have written several articles about Quakers and slavery in the seventeenth century. Two of them focus on antislavery thought, while the third examines Quaker slave holding practices in Barbados. All three of these articles begin from the premise that Quakers initially accepted slavery, but tried to reform it. In the seventeenth-century Quaker leader George Fox urged his followers to reform slavery by evangelizing to the enslaved men and women in their households. Other slave owners, however, viewed the Quaker conversion effort as dangerous. “The Ultimate Sin: Christianising Slaves on 17th century Barbados” traces the changing attitudes toward slave conversion in 17th century Barbados and shows how an attempted slave rebellion in 1675 was widely blamed on Quaker proselytizing efforts. The 1675 attempted rebellion, I suggest, linked slave conversion with slave rebellion in a new and decisive way that had repercussions throughout the American colonies. My two other articles focus on Quakers & slavery in Pennsylvania. In the first, “We are against the traffik of men-body,” I examine the first antislavery protest written in the American colonies. Through a linguistic analysis of the 1688 Germantown Protest, I show how Dutch and German migrants introduced rights-based antislavery thought into Pennsylvania. 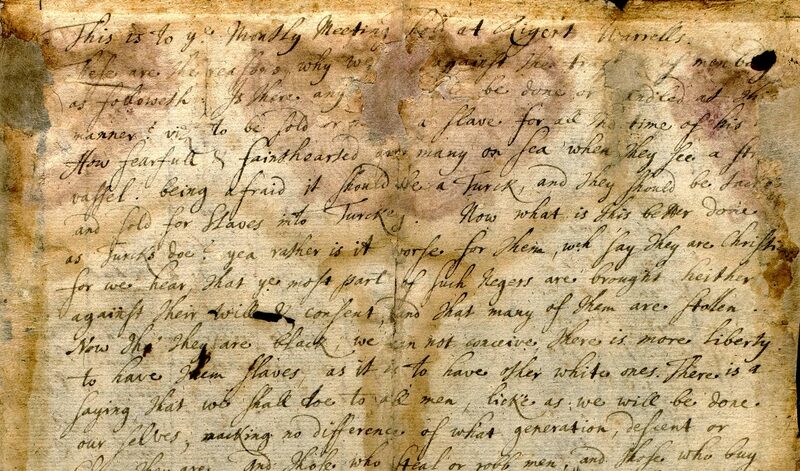 The second article, “Antislavery in Print,” explores the connections between the 1688 Germantown Protest and the 1693 Exhortation and Caution to Friends Concerning Buying or Keeping of Negroes, the first published protest against slavery. You can see the original 1688 Protest document here.